Bolstered by a flurry of recent discoveries, NASA scientists believe they could find evidence of alien life in the universe as early 2025. Much of the excitement has been around the discovery of water in so many unexpected places. Several planets including Mars, Jupiter, Saturn, Uranus and Neptune (and their moons) are believed to possess water in their atmosphere and interiors and the five icy moons of Jupiter and Saturn have shown strong evidence of oceans beneath their surfaces. "I'm going to say we are going to have strong indications of life beyond earth within a decade and I think we are going to have definitive evidence within 20 to 30 years," Ellen Stofan, NASA's chief scientist, said at a lecture Tuesday. "We know where to look. We know how to look," she said. "In most cases, we have the technology and we are on the path to implementing it. So, I think we are on the road." Jeff Newmark, NASA's interim director of heliophysics, predicted it was a matter of "when, not if" for the discovery of life beyond Earth. "The pace of our discovery is amazing," he said. "We will be visiting Pluto, the last of the planets that we haven't seen. With Solar Probe Plus, we will be visiting our nearest star in a few years. We're just continuing to discover what is out there." The optimism is also driven by what scientists are finding in distant galaxies. Thanks to the planet-hunting Kepler telescope, launched in 2009, scientists have discovered more than 1,000 exoplanets. Among those were eight new planets announced in January, including two that scientists believe are similar to Earth. Those two planets, dubbed Kepler-438b and Kepler-442b, are likely to be rocky, an important clue to their potential similarity to Earth. They are also of a comparable size - just 12 percent and 30 percent larger than Earth, respectively - and they orbit red dwarf stars that are "sun-like," though smaller and cooler. And in another positive development, scientists on Wednesday announced they had for the first time found the presence of complex organic molecules, the building blocks of life, in a protoplanetary disc - a rotating circumstellar disk of dense gas - surrounding a young star. The study described in Nature would hint that the conditions that helped spawn the sun and Earth are not unique to our universe. Using the Atacama Large Millimeter/submillimeter Array telescope, the researchers found the protoplanetary disc around star MWC 480 contains large amounts of methyl cyanide, a complex carbon-based molecule, as well as hydrogen cyanide. The scientists used what is called rotational spectroscopy, a process that identifies the molecules based on the light patterns they emit. Cyanides, and most especially methyl cyanide, are important because they contain carbon-nitrogen bonds, which are essential for the formation of amino acids, the foundation of proteins and the building blocks of life. There is enough methyl cyanide around MWC 480 to fill all of Earth's oceans. The molecules were found in the cold outer reaches of the star's newly formed disc, in a region that astronomers believe is similar to the Kuiper Belt, a vast population of small bodies orbiting the sun beyond Neptune. "Studies of comets and asteroids show that the solar nebula that spawned the sun and planets was rich in water and complex organic compounds," said Karin Öberg, an astronomer with the Harvard-Smithsonian Center for Astrophysics and lead author of the new paper. "We now have even better evidence that this same chemistry exists elsewhere in the Universe, in regions that could form solar systems not unlike our own." Öberg said the find suggests that a comet forming around this star would be similar to one that formed in our solar system and, along with asteroids, bombarded a young Earth with volatile organic compounds. "If we find a planet in a habitable zone that looks like Earth, this study shows there is a likelihood that it's chemistry would look much like a young Earth," she said, adding they will now search for other molecules in this newly formed discs to better understand its chemistry and what could be up to 100 other protoplanetary discs in our galaxy "sitting around a star similar to our sun." MWC 480 is about twice the mass of the sun and is located 455 light-years away in the Taurus star-forming region. The star is believed to be in the early stages of formation and researchers have not thus far detected any obvious signs of planet formation it. 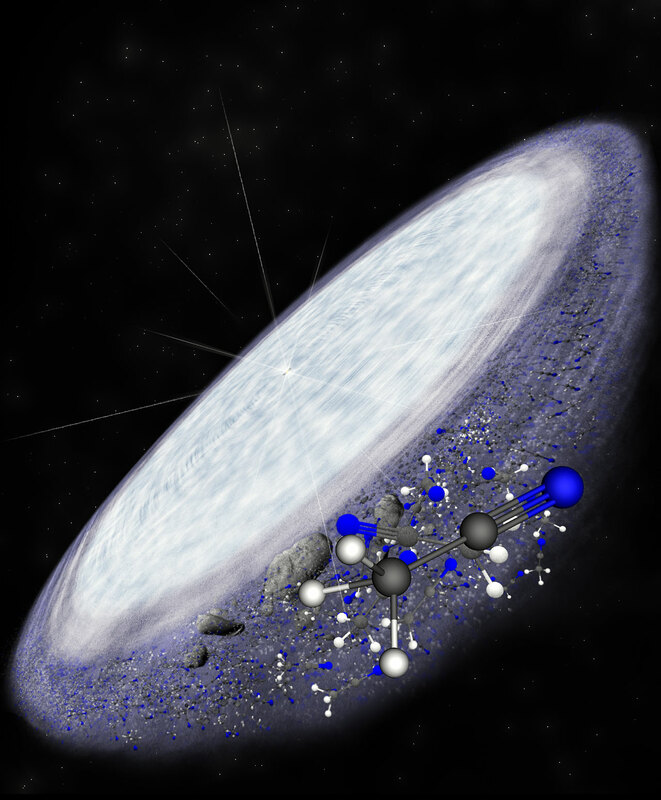 Astronomers have known for some time that cold, dark interstellar clouds are very efficient factories for complex organic molecules, including a group of molecules known as cyanides. Until now, it has remained unclear, however, if these same complex organic molecules commonly form and survive in a newly forming solar system, where shocks and radiation can easily break chemical bonds. California Institute of Technology's Geoffrey Black and University of Michigan's Edwin Bergin, writing a piece accompanying the study, said the discovery "hints at a vast reservoir of ice and volatile species that can seed the surfaces of young rocky planets or moons." "This work along with recent studies, demonstrates that protoplanetary discs are active engines of chemical synthesis and that such environments are vital for building chemical complexity long before a planetary surface is created," Black and Bergin wrote. "The potentially prebiotic chemistry traced by asteroids and comets n the solar system is therefore replicated, at least in part, in other young planetary systems - suggesting that planets are supplied with these life-bearing elements as they are born."